Fix It, Don’t Bin It! Got things which need some TLC, are perhaps a bit broken and you haven’t had the time or skills to fix them yourself? Don’t throw them away, bring them to THINQTANQ and have a go at fixing them. We will have a mix of experts and complete beginners all willing to get stuck in on their projects! You don’t need to be a handy man to fix most things and with a combination of coffee, internet videos, encouragement and some skill sharing you could well revive your posessions, save money and reduce your refuse footprint. Even if it can’t be fixed, you will still have a great time, meet new people and learn new skills! Just drop us an email on [email protected] and let us know. We will get right back to you! Try to keep the things small enough to carry! But if you aren’t sure, drop us an email at [email protected] and we will give you an idea if its a good idea to bring it! We will pair a fixer up with a fixee so they can work on the item 🙂 We plan to pop the coffee on, open the biscuits and take it as it comes. If you are happy to chat in a relaxed and awesome atmosphere whilst tinkering and learning new skills, this could be your new saturday destination! There is no minimum age, but for safeguarding reasons under 18’s need to be accompanied by a parent or guardian. Simply email [email protected] and tell us what is on your mind! Hi all! 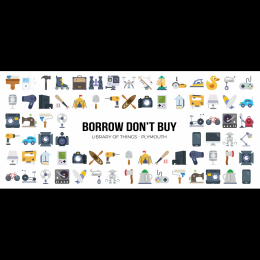 We are a small team of volunteers running Borrow Don't Buy - Plymouth's First Library of Things.